The new Bright Spark lightbox is an ultra portable, and stylish lightbox. Designed for people with a busy lifestyle or who need their light in a small package. 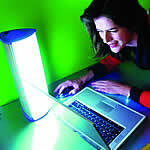 You can get your full daily dose of light therapy without taking any extra time out of your day. It's particularly suitable if you are routinely seated doing paperwork or computer work for an hour or two each day. It does still however give out a 10,000 lux.